Users often have a need to drive external loads in a test system. These loads could be solenoids, high power relays that are physically too big to fit a chassis or even microwave relays where there is considerable advantages to place the relay in the RF path in order to avoid loss and VSWR issues associated with cabling from the source to the chassis and back again. External loads can present a few problems in their management, for example driving relay coils can create large voltage transients when the switch is opened (especially if the coil has a faulty back EMF suppression circuit) or high inrush current for capacitive load switching. Test systems have to be able to deal with both working and faulty parts if they are to have a useful life, so when driving external loads it is important to use drivers that provide protection against both damage to the drivers themselves and the test system. In some applications the user may also wish to check the driven load has the correct voltages present. This combination of features makes these modules extremely robust and hard to damage by accidental abuse. The 40-411 provides 64 outputs that are designed to connect one terminal of the load to ground. With a 1A rating and being able to handle voltages to 60V it can handle many load switching applications. For example when driving SP6T microwave relays using an external positive power supply 10 relays can be supported from a single module. The current and voltage rating are sufficient to handle all the common coil designs (12V, 24V, 28V) so 10 SP6T Microwave Relays can be supported from a single module. 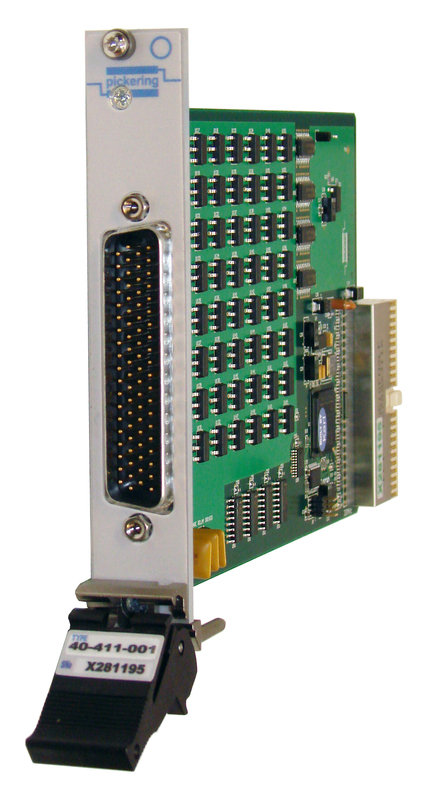 The 40-411 can also be used for driving other microwave relay configurations such as SP8T (8 off) and SPDT. The 40-412 supports 32 channels and unlike the 40-411 has the capability of switching loads to either the supply or to ground. In addition the module has a digital input function that by connecting to the load drive allows the user to check whether the voltage is below or above two voltage thresholds, each of which can be programmed by the user. In this case the module could for example drive 5 off SP6T microwave relays from a single slot, but can also check the coil drives being driven correctly. In industrial control systems it is common for users to drive loads from say a 24V load and to be able to check the load voltage is either below 20% of supply voltage or above 80% of supply voltage. The 40-412 provides an elegant facility for doing this by simply reading back the status of the digital inputs having set the dual thresholds appropriately. Like the 40-411 the design is fully protected and with output ratings of 0.4A is able to deal with most loads up to 50V. It can also be used for driving Microwave Relays and the readback facility used to ensure the external relay coil is correctly driven. The 40-413 is similar to the 40-412 in offering 32 channels of output and 32 channels of read back, its main difference is that it handles higher current of 2A at voltages up 40V. It is therefore capable of driving much larger loads. The input read back function provides a serial read back against two threshold voltages in a similar way to 40-412. 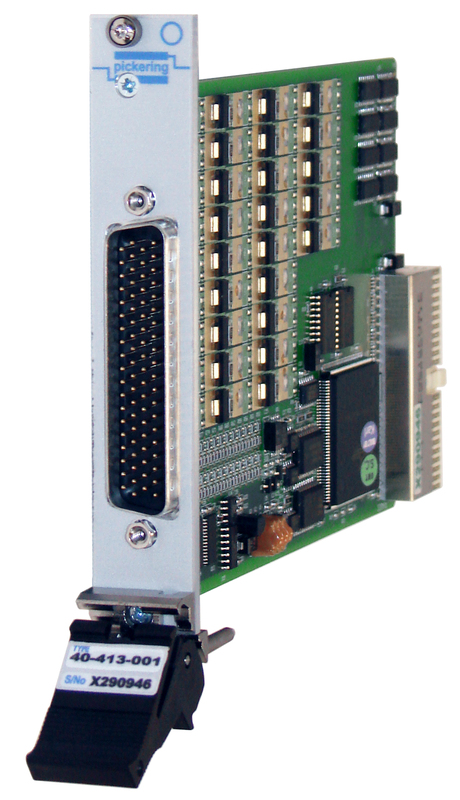 It should be remembered that the PXI digital I/O solutions can also be used in our modular LXI chassis, 60-102A and 60-103B for users who prefer Ethernet controlled solutions. 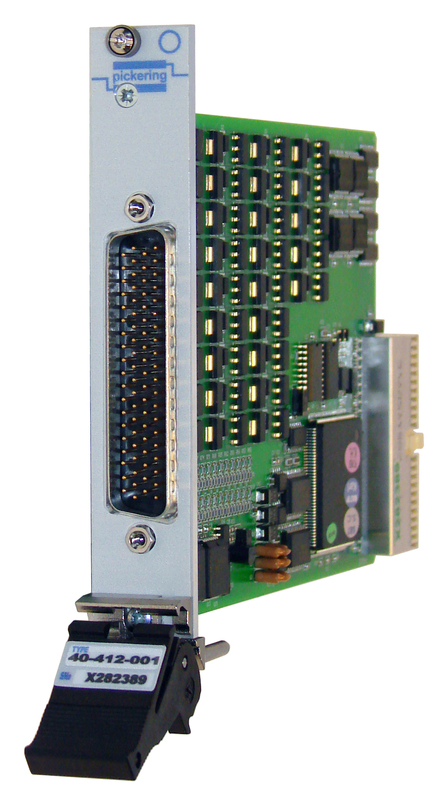 Some of Pickering Interfaces microwave solutions also include ports for driving external switches, for example the 60-750.